Giving Life by Giving Christ is sharing God’s Word with people where they are, outside of the church walls. The Bridge partners with other local churches and organizations to transform lives in our community. 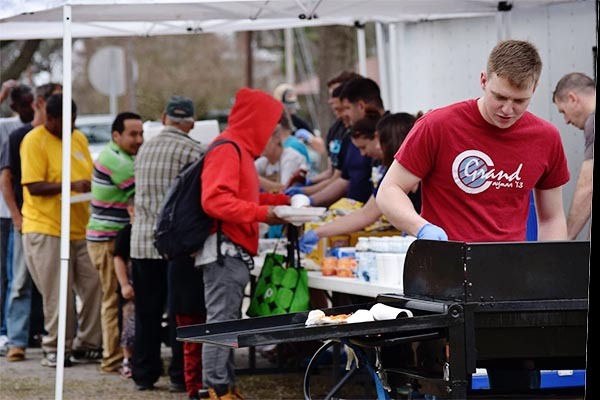 Whether it’s serving a meal at the soup kitchen, hosting Bible Study in a prison, or providing basic medical care to the needy, there’s an opportunity for you to serve in your community! Serve our local soup kitchen every Sunday. Provide outreach to our surrounding prisons every week. Partner with local law enforcement for community events. Assist with natural disaster relief. Partner with other non-profits in the area. Provide wound and medical care with the Bridge to Hope Medical Unit.